VitroGel RGD-PLUS is a ready-to-use tunable hydrogel system modified with a high concentration of RGD cell adhesive peptide, promoting the cell attachment and cell-matrix interactions during the 3D cell culture. This hydrogel system has 3X RGD peptide compared to regular VitroGel 3D-RGD, which maintain a high level of integrin binding activities even after hydrogel dilution. VitroGel RGD-PLUS has better support for OP9 cell proliferation and cell-cell communication. The stronger cell-matrix interactions help the cells to form the cell-networking structure. Figure 2, 3D view of OP9 cells growth in VitroGel 3D-RGD and VitroGel RGD-PLUS. Cell networking structure formed in VitroGel RGD-PLUS and only single cell suspension has been observed in VitroGel 3D-RGD. 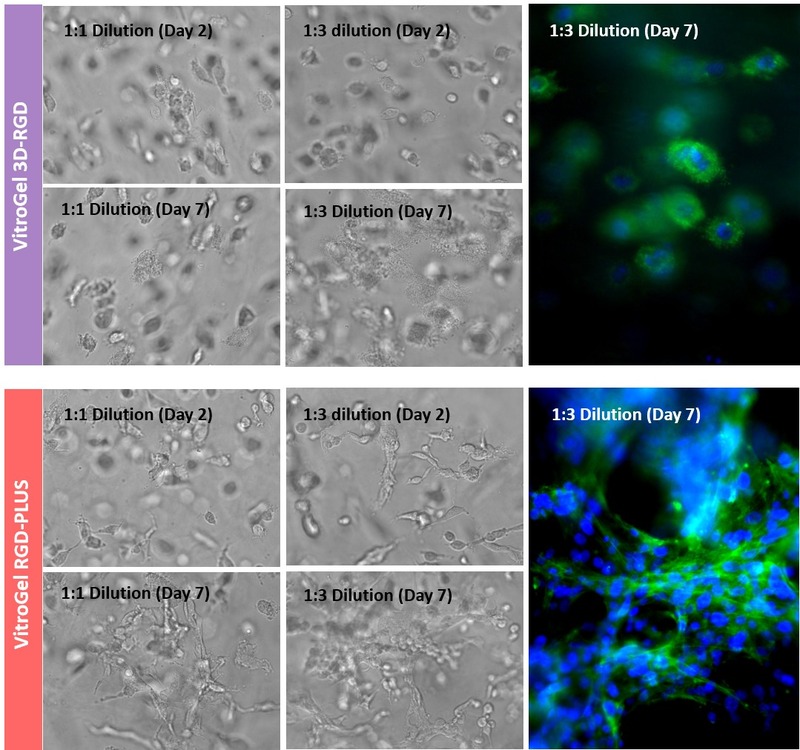 Figure 3, 3D culture of U-87 MG cells in both VitroGel 3D-RGD and VitroGel RGD-PLUS. Cells can grow in 3D hydrogel at 1:1 and 1:3 dilution of both hydrogel. However, the morphologies of the 3D cell culture are very different. Unlike the spheroids structure in VitroGel 3D-RGD, U-87 MG cells perform better cell networking structure and the cell morphology in VitroGel RGD-PLUS indicates a better cell-cell and cell-matrix interaction.